In mobile app development, if you aren’t making it multilingual, you miss providing anytime, anywhere information and services to important mobile-only audiences. Regular DigitalGov readers know that we’ve touched on Hispanic mobile trends before, including the high rates of mobile usage among Hispanic millennials. Today, we’re highlighting five Spanish language apps from the Spanish Version of the USA.gov Federal Mobile Apps Directory hosted by Gobierno.USA.gov, Aplicaciones Móviles. Multilingual app development is one way federal agencies meet the diverse needs of the U.S. population, and the listing below reflects the breadth of agencies involved in multilingual outreach. Cáncer.gov móvil: The National Institute of Health’s website offers a cancer dictionary, educational publications, news, and contact information for asking questions about cancer. Available as a mobile-friendly website. IRS2Go en Español: Taxpayers can check the status of their tax refund, sign-up to receive helpful tax tips, and read recent IRS Twitter feeds through the IRS2GO app. The app will detect the language settings on your phone and display in Spanish, if it is your default setting. Available in Android and iOS. 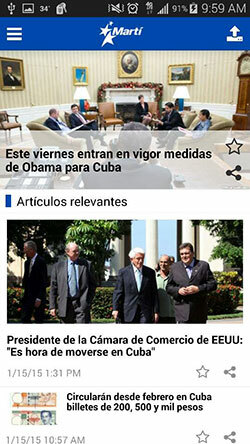 Martí Noticias: The Martí Noticias app provides up-to-date news focused on Cuba. Created by the Broadcasting Board of Governors, the app features Spanish-language video, audio and text content. Available in Android and iOS. 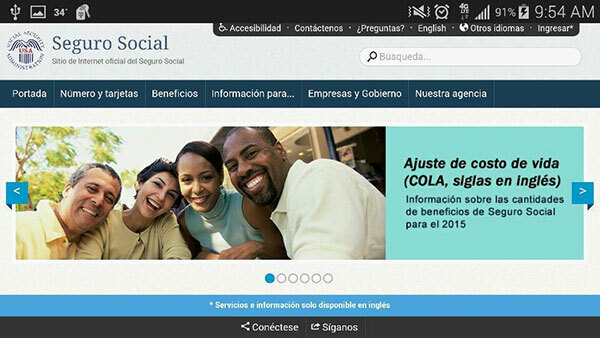 Seguro Social: The Social Security Administration’s Seguro Social website has resources about social security, a benefits calculator, and online applications. Available as a mobile-friendly website. StudentAid.gov: Federal Student Aid offers a website with information on college preparation, types of financial aid, loan management, and how to fill out the Free Application for Federal Student Aid (FAFSA). Available as a mobile-friendly website. DigitalGov offers resources for developing multilingual content that were created by the Multilingual Community of Practice. The MobileGov Community of Practice supports mobile development in all corners of government. If you have a Spanish app, be sure to register it on the Federal Mobile Products Registry. You can learn how by viewing our video for the webinar How to Get Your Federal Mobile App Promoted on USA.gov and DigitalGov.gov.